Use the control panel above or the link below to hear water flowing through an Archimedes screw. 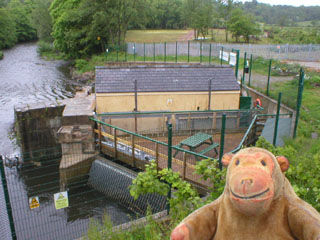 One day Mr Monkey noticed a sign in Romiley announcing a series of open days offering guided tours of the Stockport Hydro electicity generating station beneath Otterspool Bridge. He couldn't help noticing there was an open day in only a few days, so he decided that his humans wanted to take him. This led to Mr Monkey and his humans driving to Chadkirk on a rainy Sunday morning. Reading the signs outside the site. 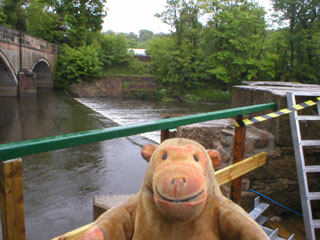 Mr Monkey parked at Vale Road carpark (that's the carpark for Chadkirk Chapel) and walked back to Otterspool Bridge. After checking the signs at the entrance to Mill Lane to confirm he was in the right place, he peered over the side of the bridge to look down on the power station. It turned out to be a single building surrounded by some interesting looking bits of concrete. Mr Monkey trotted down to the entrance gate, where he was welcomed by the guides. The tour started on the deck between the building and the bridge. A very nice lady explained that the site had been chosen for a number of reasons. The presence of the weir and the river are obvious attractions, but the site is close to the National Grid (though connecting to it still cost £30,000), and the nearby A627 provided relatively easy access for equipment during construction. The weir itself was built in the early 19th century by a Jessie Howard, a mill-owner from Stockport, who never actually built a mill at Otterspool. 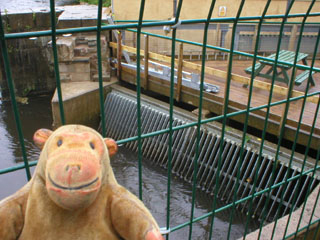 Mr Monkey tried to see the intake screens that stop debris getting into the works but decided he didn't really like leaning over the river, especially when he saw how fast the water was going through the intakes. There's a special fish run next to the station, but Mr Monkey didn't see any fish using it. Between the deck and the building are a pair of sluice gates which control the amount of water going to each of the two Archimedes screws. They've got to be careful not to take so much water that there's less than 6cm going over the weir as that could somehow damage the weir. 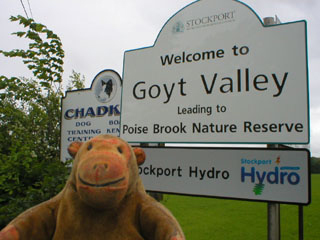 Mr Monkey was also pleased to find out that Stockport Hydro use part of their profits making grants to community projects. Gearing and generator on one of the Archimedes screws. Checking the power production figures. Mr Monkey left the deck and went into the building, which turned out to be rather full of equipment. There are the ends of the two screws, each with a gear box that increases the rotational speed going into the generator on the end by 90 fold. The electricity produced by the generator is alternating current, but, due to the varying speed of the screws isn't the right frequency for the National Grid. So between the two gearboxes there's a control system which converts the variable frequency AC into DC and then into 50Hz AC which can be supplied to the National Grid. The computer also monitors water level over the weir and controls the sluices, if necessary shutting the whole unit down. It also sends text messages about what it's done to responsible team members, which is helpful of it. 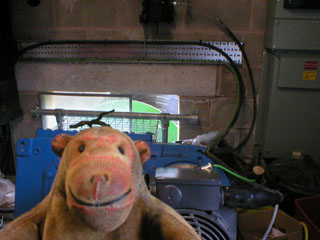 When Mr Monkey visited only one screw was in action, producing a little less than 18½kw. Of this about 1½kw were used to operate the power station, leaving about a little under 17kw to be sold to the National Grid. This is apparently roughly enough energy to power 50 average houses. 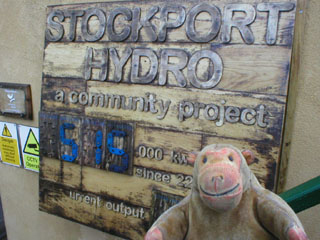 Before going to look at the Archimedes screws, Mr Monkey looked at the score board showing Stockport Hydro's electricity production since it was switched on in 2012. 515,000kw seems like a lot of kilowatts to Mr Monkey. The screws are named Thunder and Lightning. Mr Monkey watched Thunder producing electricity for a while. He was very glad that he didn't have to walk across the narrow walkways crossing at bottom of screws, or climb down long ladders to work on the screws. 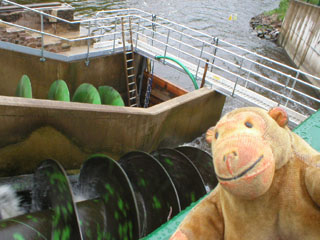 Mr Monkey finished his tour of Stockport Hydro by walking around the outer fence to get a better view of the intake screens. Volunteers use enormous rakes to remove debris from these screens every morning, to keep the flow of water clear. In 2015 Stockport Hydro will be open for guided tours between 10am and 1pm on Saturday 26th December, and between 1pm and 4pm on Sunday 28th June, Sunday 26 July and Sunday 30th August. 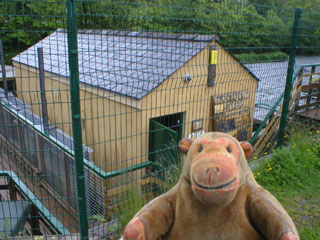 Mr Monkey recommends a visit, whatever the weather.